The airport and it’s surroundings are absolutely beautiful, there are lot’s of things to see and do in this airport, and it’s my home base so yes, I’ll be a little biased. Let’s talk a little about the architecture of YVR: The airport has a very British Columbian theme using blues and greens to reflect upon the colours of our environment. It also features one of the largest collections of Pacific Northwest Native art in the world. YVR is designed to utilize large amounts of natural light by taking advantage of large windows throughout the airport. Passengers arriving from international locations will come down escalators that leads to a platform across a large waterfall. Some very lucky arriving international passengers will get a special treat if their plane arrives at 1 of only 4 specific gates that lead through an imitation west coast forest on the way to the immigration hall. The entire airport is dotted with aboriginal art including totem poles, wooden sculptures, “The Spirit of Haida Gwaii, The Jade Canoe” (which can also be seen on the Canadian $20 bill), and more. The international terminal also features a river that runs through it as well as multiple west coast aquariums. 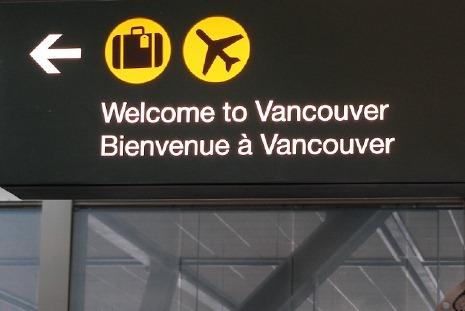 YVR features free wireless internet along with laptop work stations everywhere. There are also plenty of restaurants and shops on both sides of security. If you are waiting to pick someone up and have some extra time, I recommend you visit the newly completed “Level 4”. Which is on the unsecured side of the airport. Level 4 features giant windows that give you a view of the runways and tarmac, a very simplified flight simulator that allows you to fly anywhere in British Columbia and explore cities, an interactive model of the airport, plenty of seating, and large screens with arrival and departure information. There is also a location near the Tim Horton’s on the unsecured side where you can have a seat at a bar like table attached to large glass windows. These windows give you a wonderful view of some moving walkways on the secured side of the airport. This is an excellent place for people watching. If you’re on the secured side of the international building: I insist that you must look around once you’ve found your gate. There is just so much to see in this area! and If you’re waiting on the secured side of the domestic building: I recommend you check out “Legends restaurant featuring White Spot” You can take a look around this terminal as well. The design here isn’t as elaborate as the international side of things, but it’s still a very nice tour. Hungry and in a Rush? Many airlines no longer provide meal service on many of their flights. YVR’s food on the fly program allows you to buy freshly prepared meals and snacks that are packaged in tray table friendly containers. Alright! Well I think that’s enough about YVR, at least for today. I really hope you get to check out this airport one day… it really is magnificent.